UPDATE, 9/29: Pff. Forget all that other stuff. LoCO made the teevee! Eureka has a new police chief. This police chief has a new office. This office needs some art. Can you help? 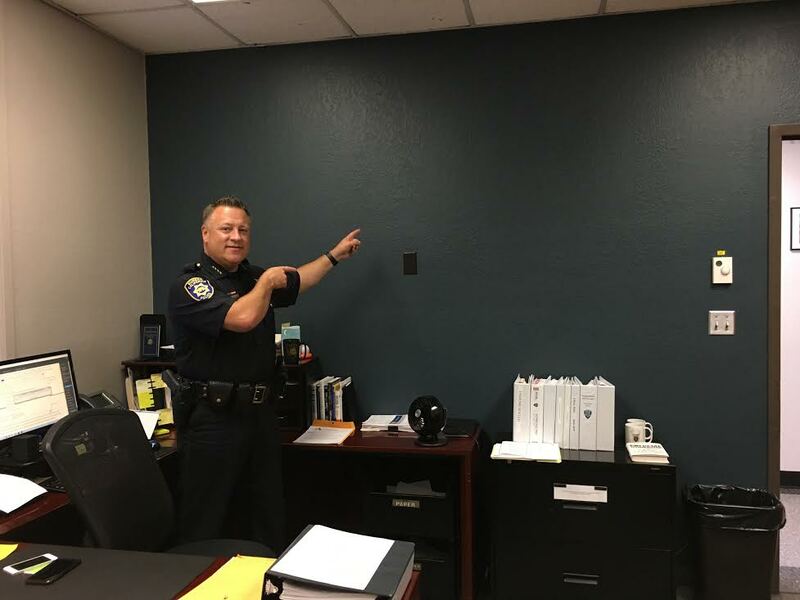 The Eureka Police Department is interested in appropriate “loaned or gifted” artwork to decorate Chief Steve Watson’s walls and has sent along some photos of his unadorned office walls to motivate us all. Chief Watson is inviting the public to help decorate the blank walls in his office. He is looking for tasteful and appropriate local art that is inclusive and representative of positive police-community relations. Artwork can be photos or paintings and should be an interpretation of the themes “Making a Difference…Together,” “Team Eureka,” “Partnership, Understanding and Trust,” and/or “The police are the public and the public are the police.” The idea is to be inclusive and depict positive aspects of our history, diversity, and law enforcement’s place and role in our community. Artwork will be hung in the Chief’s Office for an indefinite amount of time and will be seen by anyone who visits his office. If enough artwork is submitted, it is possible other pieces will be hung in our hallways or conference room. Artwork may either be loaned or gifted to the department. To have your artwork considered, email a photo of your artwork to bpowell@ci.eureka.ca.gov Artwork will be selected by Chief Watson and other members of the department. Call Brittany at (707) 441-4388 if you have questions.